MGM Instruments Gen-Probe Leader 50i Luminometer Genetic Assay Luminescent . New Life Scientific, Inc.
* Tested, passed basic initialization, sample tests were ran. * Good cosmetic condition minimal wear and age. 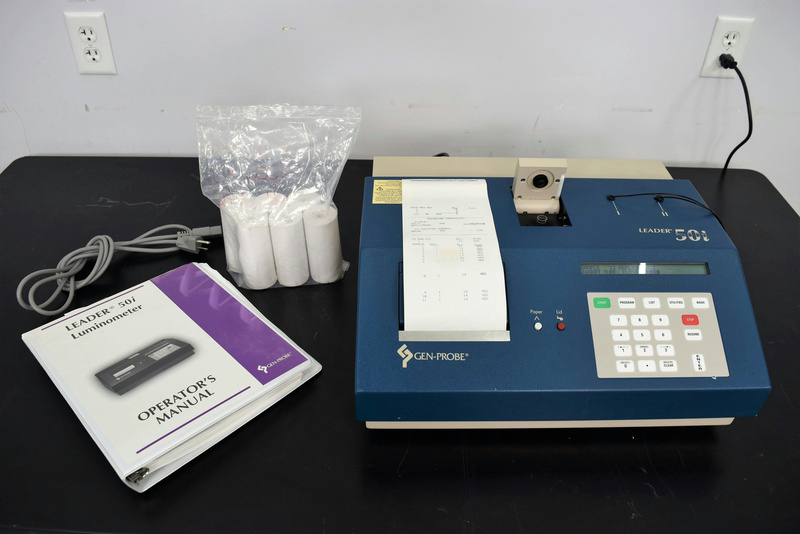 This is a used luminometer that measures the amount of light emitted from chemiluminescent reactions. It is designed to be used with Gen-Probes’s PACE, Amplified MTD, AccuProbe and GASDirect assays. It efficiently stores up to 30 protocols and accommodates the throughput needs of most laboratories today. Our on-site New Life Scientific technicians visually inspected and ran distilled water sample tests. The repetitious testing resulted in consistent data with one outlier. The technician confirmed this is a functional instrument. Tested and sample tests were ran. In great cosmetic condition with minimal wear and age.